Yesterday morning by 7 am fans were lined up clear around the Convention Center to get into Disney's first ever 3D Panel in Hall H.The line also was massive due to the fact the Summit Entertainment panel including the "Twilight Saga's New Moon" was following the Disney panel). Within the panel fans were treated to our first ever 3D look at Tim Burton's "Alice in Wonderland". The footage shown was cut a bit differently to the released trailer (embedded below) and matched with the music of MGMT's Time to Pretend instead of Depp's narrating. 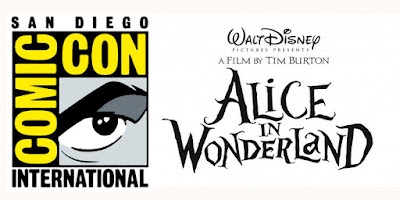 Both the trailer released online and the footage seen at Comic Con are fantastic taste of what is in store in Burton's Wonderland. During the panel moderated by Patton Oswalt Tim Burton gave fans a bit of a surprise when he brought out Johnny Depp for fans to see. Sadly, that was all Johnny Depp did was come out and wave to fans. Would've been much happier to have allowed him to actaully talked instead of just smiling and waving. Burton told the crowd he felt very much like the White Rabbit constantly watching his ticking clock trying to finish this film in time. Most of the questions asked of Burton were pretty lame and gave the crowd no real informative news we did not already know.